The Fellowship was fortunate enough to obtain a copy of BLOODSHOT AND H.A.R.D. 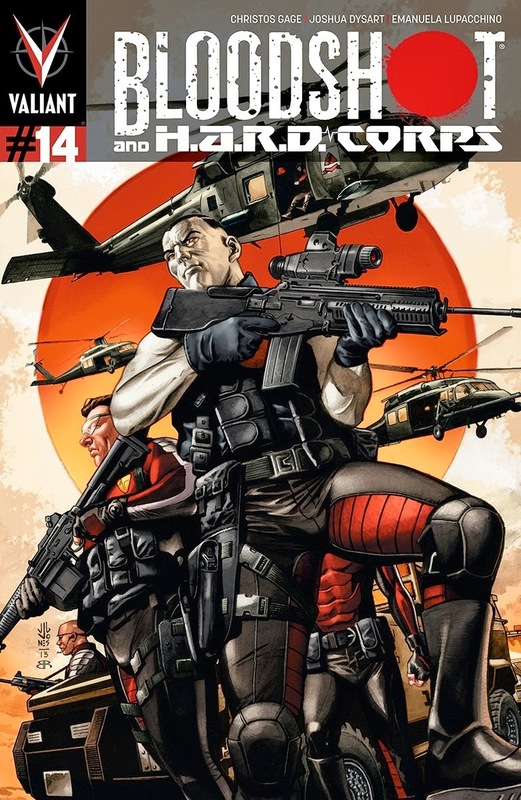 CORPS #14 from Valiant Comics. The story is by Christos Gage and Joshua Dysart with pencils by Emanuela Lupacchino, inks by Guillermo Ortego, colors by Brian Reber with Ian Hannin, and lettering by Simon Bowland. Project Rising Spirit has recruited a reluctant Major Palmer to lead the new H.A.R.D. (Harbinger Active Resistance Division) Corps. The group’s first mission is to rescue Bloodshot; who is currently in the hands of Harada Global Conglomerates. Toyo Harada wishes to discover the secrets that lie within the nanites in Bloodshot’s body. Yeah, you know this won’t be an easy task for the Corps. Valiant continues to impress since their return a little over a year ago. I’ve enjoyed Christos Gage’s work since his AVENGER’S ACADEMY days. With him teaming up with Joshua Dysart (HARBINGER), I expect this great series to be even better. Emanuela Lupacchino and Guillermo Ortego work well together and I really like the look of the issue. Valiant keeps pressing all the right buttons, and they show no signs of stopping. BLOODSHOT AND H.A.R.D. CORPS #14 is in stores now or available for ordering at www.ValiantUniverse.com.